Geotimes - August 2007 - No more “snows of Kilimanjaro”? No more snows of Kilimanjaro? Mount Kilimanjaros glaciers have receded dramatically, making the highest point in Africa a high-profile poster child for global warming. Some scientists contend, however, that Kilimanjaro is a poor example, as its glaciers were disappearing before warming set in. The rapidly receding glaciers at the summit of Africas Mount Kilimanjaro have made the picturesque mountain a poster child for global warming, even earning it a featured role in Al Gores film An Inconvenient Truth. But Kilimanjaro may not be the best choice for that honor, some scientists say: Unlike the glaciers on other mountains, Kilimanjaros glaciers may not be suffering from human-induced global warming so much as from reduced precipitation  and that may be just a return to normal for the region, they say. Towering over northeastern Tanzania, Kilimanjaros snowy summit, like the Andes Mountains in South America, contains tropical glaciers, which behave somewhat differently than higher-latitude glaciers, according to Philip Mote, an atmospheric scientist at the University of Washington at Seattle, and Georg Kaser, a glaciologist at the University of Innsbruck in Austria, writing in the July/August issue of American Scientist. Most of the worlds glaciers have receded in the past 150 years, and warming appears to be the primary culprit, they say. In the tropics, however, glaciers exist only at the highest elevations, and their size is controlled more by seasonal changes in precipitation than by air temperatures. Although global warming has an indirect impact on atmospheric moisture concentration, observations of the change in ice mass at Kilimanjaro suggest it had already decreased by 66 percent from 1880 to 1953  long before global temperatures began to rise rapidly beginning in the 1970s, Mote and Kaser say. Instead of looking at warming, the balance between energy inputs and energy outputs are key to understanding what goes on at Kilimanjaro, Mote says. At Kilimanjaro, the primary input of energy to the mountain is solar radiation, while the primary output is sublimation, the transition of ice directly to water vapor. Because neither depends primarily on surface air temperatures, warming doesnt play much of a role in the loss of ice at the mountains summit, Mote says. Furthermore, he says, the ice on the mountain forms hard-edged features  high vertical walls and sharp, finger-like features called penitentes  that show evidence of sculpting by direct, focused radiation from the sun, rather than smoothing by diffuse warming of the atmosphere. 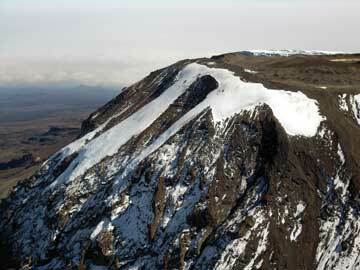 Rather than warming, a prolonged dry period may be responsible for the shrinking glaciers on Kilimanjaro, Mote says. Surface observations of water levels from nearby Lake Victoria suggest that water levels have been declining since the end of the 19th century, suggesting that the extent of the glaciers observed by Western explorers in the late 19th century may have been due to an anomalously wet period in eastern Africa, rather than to cooler temperatures at the time. Mote and Kaser, both authors on the Intergovernmental Panel on Climate Changes Fourth Assessment Report, have taken some flak for the report, Mote says, both from Gore fans, who say they are trying to undo his work, and from anti-global-warming bloggers, who call them all sorts of names for asserting that global warming is still robbing most other glaciers of their ice, Mote says. That most of the worlds other glaciers are being lost due to global warming is a point, he says, that he wants to emphasize. Moreover, the underlying finding of Mote and Kasers work  that solar radiation and sublimation are the primary actors on the mountains ice loss  has been known for decades, a point that Mote and Kaser acknowledge in their study. And with only a few early photographs prior to the satellite images of the 1970s, scientists could only rely on visual estimates of ice area rather than more accurate assessments of total ice mass on the mountain, Hardy says. As a result, there is simply no way to make an accurate assessment of how glacier retreat rates have varied in the past. For that reason, he says, he worries that talking about it serves only to muddy the waters, and give fuel to climate-change skeptics. Glaciologist Lonnie Thompson of Ohio State University in Columbus is also concerned about how the study might affect peoples perceptions of the impact of climate change, and might confuse issues on Kilimanjaro itself. With the mountain having lost 22 percent of its ice area between 2002 and 2006, the glaciers on Kilimanjaro are dying, Thompson says. Arguing that precipitation rather than temperature is to blame is a red herring, he says, as global warming affects both temperature and precipitation. Thompson says he expects new aerial photos of the mountain that map the extent of ice retreat to help show the true impact of warming. That visual evidence, he says, will likely demonstrate that Kilimanjaros glaciers are behaving just like every other tropical glacier on Earth  shrinking.